This article is about the town in Kent, England. For the creek in Essex, see The Strood. Strood was incepted as a manor then chapelry of Frindsbury until gaining its own parish status in 1193. Today Frindsbury is effectively, in all but a few associations such as in the Church of England, the northern part of Strood. Strood's history has been dominated by the river and facing port-associated towns, particularly its road and rail bridges since the Roman era to Rochester and the two other Medway Towns immediately adjoining and beyond from the north-east quarter of Kent to London and the rest of Britain. It has a mixed retail and leisure area at its heart. 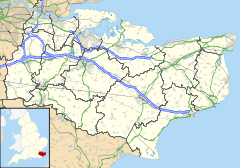 Most of its sources of employment are the other Medway towns, their associated commercial, industrial and logistics parks and London, as an outer commuter town. Among its broadest named neighbourhoods are the "Earl estate" and Marlowe Park, one named after a house builder, the other after the grounds of a former mansion house. High Speed 1 and the M2 form the southwestern boundary of Strood. The far end of Medway Valley Leisure Park. The Crispin and Crispianus pub is typical of the shiplapped houses in Strood on the higher ground, On 27 March 2011 the pub was set alight. Strood was part of Frindsbury until 1193. It was named "Strodes" in the Textus Roffensis, though most early records use the spelling Stroud. The Old English name Strōd refers to a "marshy land overgrown with brushwood". The Romans built a stone bridge and laid a road on a causeway across the marshy ground. The foundations were about 8 ft below the level of the 1856 road. The road went up Strood Hill, and was called Watling Street, as it still is today. This is the A2 road. There is further evidence of a causewayed road leading along the bank towards the Frindsbury Peninsula leading to a villa, was found in 1819. The present road and field pattern suggest that there was a substantial Roman agricultural settlement centred near Frindsbury. In 764 AD Offa King of Mercia and Sigered King of Kent granted to Eardulph lands in Easlingham (Frindsbury). In 840, 994, and 998 AD Strood was pillaged by the Danes. In 960 AD a wooden bridge was built across the Medway. A small wooden church was erected at Strood in 1122, as a chapel of ease in the parish of Frindsbury. Land was granted in 1160 to the Knights Templar by King Henry II. The Manor House was used as a Lodging House. In 1193, Strood became a parish. It was run by the monks of Newark Hospital, and had its own burial grounds. Corruption in the finances of the Newark Hospital set in and worsened until reforms were put in place formally in 1330 by the Bishop of Rochester Hamo de Hethe. In 1291 there was an affray at Newark Hospital between the Monks of Strood and the locals from Frindsbury. In 1264 Simon de Montfort laid siege to Rochester Castle from the Strood Side. In the action the wooden bridge was destroyed by fire. After Simon's death a heavy fine was levied on Strood because he had stayed there during the siege. The Strood Quay and Strood Wharf had been built by Bishop de Glanville with rents going to Newark Hospital. In 1293 the Rochester wharf was in such disrepair that ships had to use the Strood facilities, however as the bridge was out of use, ferries had to be used to cross the river. In 1309, a harsh winter, the bridge was damaged by ice. In 1312 the Knight's Templar were suppressed and the Manor of Strood passed into private hands briefly before being passed on to the Abbess and Sisters Minorites of St. Clare of Denney in Cambridgeshire. In 1387 a stone bridge was built by John de Cobham and Robert Knolles. In 1460 Edward IV appointed a mayor of Rochester with jurisdiction over Strood river frontage and the houses there. Strood was owned by the Rochester monastery from the 18th year of Edward III's reign until the Dissolution of the Monasteries under Henry VIII, after which time as part of the Hundred of Sharnel(Shamwell) which included Cobham, it was passed to George Brooke, Lord Cobham. His grandson Henry Brooke lost his estates to James I in 1603 through a false charge of treason, although he escaped with his life. The Temple Manor thereafter was granted to Sir Robert Cecil, the Earl of Salisbury (son of William, Lord Burleigh), who later became Lord Treasurer of England under Queen Elizabeth, and married Elizabeth, sister of Henry, Lord Cobham. 1554 Thomas Wyatt of Allington, heard that the queen intended to marry a Catholic and gathered an army with intention of marching to London. He took Rochester Castle and The Bridge. According to Marsh there was to have been a battle at Strood, but the Queens men deserted. However Coulson records that Wyatt defeated the Duke of Norfolk and seized six cannon. Wyatt then marched on Cooling Castle. The rebellion fizzled out and Wyatt was executed along with captain of the deserters. The parish accounts begin in 1555. Following the accession and marriage of Queen Mary (known as "Bloody" Mary) the country reconverted to Roman Catholicism and a considerable sum was spent re-converting the church. However just nine years later in 1565 a further five-year period of refurbishment was required to convert the church back to Protestant usage following the accession of Queen Elizabeth I. The parish registers start from this date. Possibly mindful of the changes, the churchwardens waited until 1574 before going to St. Dunstan's Fair in Rochester to sell "a cross and other relics of Roman superstition, formerly used in Strood Church". To the Honour of God. and for the Benefit of the Poor. of this Parish, This House was. Built with Mr. Watt's Charity. A.D. 1671 in which the Sick and. Aged are taken care of; ye Ignorant. instructed, Such as are Able to. Work Imployed, & a Comfortable. In the 1672 the parishes of St. Margaret's, Rochester and St Nicholas, Strood jointly applied to the Court of Chancery for a ruling which was decided in their favour to extend the area over which Watts charities could operate. The parish of Strood utilised some of the money to provide a workhouse for the poor. Above the door was set a stone slab which is now displayed in the Guildhall Museum, Rochester. The text is reproduced alongside. In 1769, under authority of the 1768 Paving Act, a tollgate was erected at The Angel Inn on North Street in Strood, to pay for improvements to the parish. Hasted, in his study of Kent (1778–99), said Strood's inhabitants were chiefly seafaring or fishermen, and engaged in dredging oysters. Between 1804 and 1824 the Thames and Medway canal was dug. See below, under Transport for more details. The ancient City of Rochester merged with the borough of Chatham and part of the Strood Rural District in 1974 to form the Borough of Medway, later renamed the City of Rochester-upon-Medway. In 1998 another merger with the rest of the Medway Towns created the Medway unitary authority. Strood lies on the edge of marshy land alongside the River Medway. The chalk hills of the North Downs have been breached at this point, forming a river cliff rising to 100 ft directly behind. Two gentle chalk valleys, or bournes, descend to the River Medway here, one takes the A2 towards London on its north slope. Another takes the road to Cliffe, and to Hoo. The land has been extensively quarried for chalk and the covering brickearth. These quarries have then been used for housing. The river frontage has been drained and infilled, firstly for industry, then for transport links, and finally for housing. To the north of Strood are the remains of the canal basin, and to the south the M2 motorway bridge and High Speed 1 bridge. An annual fair was instituted in 1206 during the seventh year of King John's reign to the priory of Rochester, to be held on 26 August, which continued well into the 18th Century, according to Hasted, the Kent historian. It was traditionally held over three days, and associated with Christian celebration of the Assumption (15 August). The Strood Fair was held regularly into the 1970s. The land used for the Strood Fair was sandwiched between Grange Road and Station Road, adjacent to Strood railway station. It was for many years part of a dairy farm, though by the 1970s the farm building had been turned into a motor repair business. The fair ground was passed on to the people who ran the Strood Fair. It was then used by them to stay through the winter months. Gradually the number or fairs held on the land dwindled. The land is still occupied as winter quarters by the Showman's Guild with its running costs supported by an annual fair on the site. In June 2007, the motor repair building was demolished to be replaced by flats. Today's market is held on a Tuesday and Saturday, and a boot fair is held on a Sunday. Gilbert de Glanvill, Bishop of Rochester, in 1190, early during the reign of Richard I founded a hospital in Strood, east of the church, which was afterwards called the Newark or Stroud Hospital, the Yoke or North Yoke being a small manor in Strood. Newark Hospital was important in raising the profile of Strood, however there was constant concern about it financial management, and the rivalry between it and the Rochester Priory. In 1830, under King Henry VIII, the hospital was under the control of the Dean and Chapter of Rochester. The location of the former Newark Hospital is now mainly a car park behind Strood High Street. The 19th century railway embankment carrying the Chatham Main Line cuts across the back of the old hospital site. Strood Market is held on part of this land, but was relocated to make way for a food store, Aldi. An archaeological dig of the site was done in the 1970s. Strood Rural District was a local government district of Kent from 1894 to 1974. It did not include Strood itself (which formed part of Rochester) and covered a wide area. The offices of Strood Rural District Council were in Frindsbury, Strood; they are now a nursing home called Frindsbury Hall. Strood is part of the parliamentary constituency of Rochester and Strood. Local government was consolidated in the late 1990s into a single tier with the creation of Medway Council. Small enterprises were formed to service Chatham Dockyard. Joseph Collis started as a retail ironmonger in 1777. By 1865 he was a wholesaler specialising in zinc, iron, tinplate and locksmithery. By 1870, he and his partner Stace took over the Pelican Foundry and manufactured structural ironwork, toilet cisterns and manhole covers. Thomas Aveling built his traction engines at the Invicta Works next to Rochester Bridge from 1861. Later the works were acquired the Collis and Stace's Pelican Foundry. Avelings were noted for excellent employment practices, and made their premises available for meetings of co-operative and radical societies. Avelings in turn became Wingets factory, then the Rochester-upon-Medway Civic Centre which passed to Medway Council. Shorts, the seaplane manufacturer, used a yard on the Strood side for construction of the airframes of F3 and F5 flying boats. Other employers were Hobourn-Eaton, Kent Alloys, Fishers and the Co-operative bakery. Settlement geography tells us that a bridging point becomes a route centre and a trading centre. Being a lowest bridging point of a critical prehistoric military route compounds the problem. Towns had to built above the flood plain at a pinch point and flat land on the Rochester side of the river was needed for a walled town with castle and cathedral, in effect sterilising the land that side of the river from future major development. The land was locked by the construction of the London, Chatham and Dover railway in an embankment and arches. Small shops grew up around "The Angel" in Strood forming the town centre. Further small rows were built within the housing along Gun Lane and at Darnley Road. By 2005 Strood was served by two supermarkets. Tesco acquired and demolished Temple Street and bought the freehold of all the other plots on the block for future expansion. Safeway in the High Street built on the site of small firms and the Budden and Biggs Brewery. Following the takeover by Morrisons the store was closed with a new, larger, site built at the far side of Jane's Creek. The town centre store lay empty until autumn 2008 when it was redeveloped by the marginal supermarket retailer Netto and discount chain Wilko (the Netto store has since been remodelled as an Asda following a buyout). Matalan moved to Strood Retail Park, extending the retail offer toward Jane's Creek. In 2009 the site was fully redeveloped with another two retail units on either side. KFC and Paul Simon moved in next to Matalan, extending the retail and leisure offer, and Subway moved into Strood High Street in 2011 giving the centre a more modern focus. Thompson Travel closed, and the empty unit sat there for around 8 months until Greggs took it over. Thus we see that the economics and demographics of the area were right for expansion. Tesco planned for a brand new store to be built on its acquired land in February 2013, but after a national policy change in March 2013 it announced that it would focus on smaller Express stores. The Tesco Store was to include a community hub and library which would be for Medway Council and would have replaced the annex at the previous Civic Centre site in Strood. An Aldi supermarket also opened on land opposite the Angel Corner (the former site of Strood Market) in November 2012, three years later than originally planned – with locals opposed to the Tuesday and Saturday markets being relocated to the Commercial Road car park. Strood Retail Park has grown to include Next, Argos, Poundworld, Carpet Right, Matalan a KFC. The nature of the offer reflects the markets interpretation of the local economy. The Poundland store opened in the Retail Park in February 2015 in the former Paul Simons store. Poundland went into administration on 11 June 2018 though administrators are hoping for a rescue package. In March 2015 It was announced that B&Q would be replaced with a Gym, Cafe and 3 shops. In January 2016 It was announced that Brantano would close due to going into administration. The store subsequently closed on 22 March 2016. A Poundworld store opened in the Retail Park in May 2016 in the former Brantano store. In early 2017 it was announced that an M&S Foodhall, B&M and a Maplin would open at the former B&Q site. It was then later announced in July 2017 that Starbucks Coffee would be opening amongst the new retail units on Strood Retail Park. In February 2018 It was announced that Maplin would close due to going into administration. 1863 Map of Strood and Frindsbury: note the undrained land between the railway and Frindsbury Hill, the creeks behind the Civic Centre and the lack of houses. 1909 Map of Strood and Frindsbury: note the growth in houses. There is no separation between Strood and Frindsbury, an extra church in Frindsbury parish to accommodate the new houses, and note also how Jane's Creek has been developed; later this will be back filled to provide land for retail. Transport in Strood was dominated by the river. From the earliest times river transport used Strood, but before the coming of the Romans the area was marshy and not well populated. Once Strood started to be filled in various boatyards and ship repair businesses started up both on the river and in the creeks which drain the marshes. Although Strood must have lain on ancient tracks, the coming of the Romans started to fix the road pattern. The lowest bridging point of the River Medway is between Strood and Rochester, and the first bridge was built soon after the Battle of the Medway. This road from Dover via Longdon towards north Wales became known as Watling Street and forms two of the major highways of the Kingdom. The section from Dover to London became the A2 trunk road. The 20th century has seen a major expansion in road transport and the consequent building of the M2 motorway. The route roughly parallels the old A2 and has necessitated the building of two high level bridges in Strood to the south of the town. Beyond the M2 is the M20 motorway leading to the south of London and accessible by major roads from Strood. Strood is on National Cycle Route 1. The Thames and Medway Canal was dug between 1804 and 1824 to provide a safe route between the rivers Medway and Thames. Barges were able to avoid the long passage into the Thames estuary and around the Isle of Grain. At the Strood end the canal was entered through a lock into Frindsbury basin and then entered a tunnel. It opened 4 October 1824. The canal was 8 ft deep (2.4 m) with 27-foot (8.2 m) headroom and 26 ft 6 in (8.08 m) wide, to take 94-foot-long (29 m), 60-ton Thames Barges. It had a 5-foot (1.5 m) tow path its entire length. Spoil from the tunnel was used to infill the marshland between St Mary's Church Strood and the River Medway. Frindsbury Basin could handle vessels to 300 tons. A steam pump was installed there to keep the canal topped up. Commercially the venture was a failure, because tolls were high to recoup the cost, entry to the basins could only occur at high tides (making it quicker to sail the 47 miles (76 km) round the Isle of Grain). With the end of the Napoleonic wars the military justification had also been removed. In 1844 A single line railway was laid through the tunnel, part on the towpath and part on a timber structure over the canal. The canal was sold in 1845 to the South Eastern Railway (SER), who filled in the canal within the tunnel and laid a double track (see North Kent Line). The South Eastern Railway terminated at Strood, with passengers taking a steamer or coaches to reach Rochester or Chatham. The station, completed 10 February 1856, was opposite The Railway Tavern. More recently it was called the Old Terminus. On 18 June 1856, the line was extended along the river bank to Maidstone, and Strood Station we see today, was opened (see Medway Valley Line). Also in 1856 the new road bridge over the Medway was opened, in its present position, back where the Roman bridge had been. In 1857 the mediaeval bridge was demolished the stone being used to build the Strood Esplanade in 1858. In 1860 the SER built the Strood pier. The South Eastern Railway retaliated by building a parallel bridge (after 1866 and before 1909) and running a separate line into Chatham. To do this the Watermill was demolished and the Mill Pond filled in. Over the pond was built an Oil and Seed Mill with its own sidings. There was a loop between the lines at Strood, opened 29 March 1859 which closed in 1860. In 1875 Mayor N. E. Toomer forced the two companies to reopen the loop, now nicknamed Toomers Loop. The service resumed 1 April 1877. The SER and LCDR effectively merged on 1 January 1899 to form the South Eastern and Chatham Railway. Subsequent rationalisation saw the closure of the SER branch to Chatham, and the closure of the LCDR Strood station. The SER bridge over the Medway was retained for the Chatham Main Line, and the LCDR bridge was abandoned (its piers were later used for the second road bridge). The link between the two lines was used to run services from the Chatham line onto the North Kent Line. For the current railway station see Strood railway station. All Strood below The Angel Inn, on North Street, near Strood Post Office, was built on marshland which was fed by small creeks, these were excavated to make usable jetties and wharf. Two such creeks are well known, Janes Creek which once extended back to the Cricketers Inn, and Temple Creek. Joining Janes Creek, at a right angle was Pelican Creek which has been in-filled and now forms a car park and the foundations of B & M. Strood frequently flooded and the area around Temple Street (now a car park and a Tesco) was known as the 'Swamp'. In such a low-lying area, flooding is a danger. The reconstruction, after a flood, provides a boost to economy and the opportunity to effect structural change. Floods of significance have been recorded in Strood in the years 1158, 1235, 1309, 1682, 1735, 1791, 1854, 1874, 1887, 1953, 1968 and 1979. William Curel was Medway's oldest established barge builder, with two yards on the Strood bank. The Curel's Upper Yard was next to the Railway Tavern. In 1900 Gill and Son took over the yard, and it became a sail loft. There was a windmill on Strood Hill, two on Broom Hill and five in neighbouring Frindsbury. The Strood Hill Mill was a smock mill that was demolished in 1860. It was unsuitably sited, and suffered from variable winds The site now forms part of the Cedars Hotel. Killicks Mill on Broom Hill cap was blown off for the second time in 1880. It was replaced and worked again for a year in 1890 but was unprofitable and was probably demolished in the 1920s. It had six sides rather than the usual eight. Fields Mill on Broom Hill burnt down in 1875. In Dickens' times, the Miller was a Mr Clark, but the owner was Mr Field. Mr Field was an amateur musician, who kept a piano, a harp and a barrel organ in his sitting room. It is said that the organ was bought from Loose Church, and so fixed that the power from the mill turned the organ's handle. Dickens would visit the mill on his walks, and listen to the organ music. The oldest was a tripod – or post mill. It was called the Quarry Mill and was 100 yards south east of the church. Destroyed in 1850. The other four mills were all owned by Mr Kimmins. On Prospect Hill there were two mills. The first was called Manwaring Mill, or Little Mill. It was a black tarred smock mill, and it drove four sets of stones. Little Mill was struck by lightning and demolished in 1886. Also on Prospect Hill was Great Mill or Rose's Mill. It was the highest in Kent with 40 feet by nine feet sweeps. Together the two mills produced 400 sacks of flour a week. Great Mill was demolished in 1890. Kimmin's Mill on Frindsbury Hill was a smock mill with no base. The land became a brick field. A man was killed by its sweeps. House Mill, also known as Kimmins Mill or Frindsbury Mill, stood on Frindsbury hill and was a black smock mill. It was demolished in 1931. There was a tidemill. When the tide was rising, water flowed into the mill pond driving a mill, when the tide was falling, water flowed back into the river, driving the mill. The damson cultivar 'Farleigh Damson' has gained the Royal Horticultural Society's Award of Garden Merit. 'Farleigh Damson' (syn. 'Crittenden's Prolific', 'Strood Cluster') is named after the village of East Farleigh in Kent, where it was raised by James Crittenden in the early 19th century. An 1871 letter to the Journal of horticulture and practical gardening claimed that the original seedling had been found by a Mr. Herbert, the tenant of a market garden in Strood, who had given it to Crittenden. It has small, roundish, black fruit, with a blue bloom, and is a very heavy bearer. Its heavy cropping led to it being widely planted in England. Work progresses on the foundations of the first houses in the Medway Gate Housing Development. The area of Strood around Knight's Place and Temple Street, was referred to as the Swamp. On the floods Smetham wrote in 1899 in that woebegone spot the foul contents of water closets were washed into poor peoples homes, and an indescribable filth permeated the fetid spot for months. In 1912 there was a typhoid outbreak here, 56 people contracted it, and five died. In the 1880s, there was a major expansion of houses. Terraced houses were built on the hill, closing the gap between Strood and Frindsbury. The land around St Mary's, now drained and close to the station was used. There was a mix of house sizes, from the large detached to the small terraces that opened on the street. They were all built in local yellow brick, with detailing in reds. Following World War I, the city built 19 houses in Steele St, and 73 on Frindsbury Hill (Murray Road). Following World War II, under the Housing Act, 1946, and the Housing Subsidies Act, 1956 the city continued to build, including the triangle between the A228, Watling Street and the M2. With continuing population growth and pressure from commuters, more and more land has been developed by the private sector. By 2000, the riverside by the station had been developed. Kingswear Gardens off Canal Road is a social housing estate. Kingswear Gardens is a high crime area, and is prone to flooding. The chalkpit by the A228 at Merral's Shaw now has 400 dwellings on it, in spite of the massive infrastructure work needed, (roads and landscaping) this development is called Medway Gate. In 2009, plans were in existence to build over the Temple Marsh. Up to 620 homes are planned to be built and up to 12,300 sq metres of mixed-use employment and retail floorspace to develop. Now renamed as 'Temple Waterfront'. There are concerns for the architectural heritage in the area. A sad loss of an Edwardian gem occurred in 2010 when Medway Council demolished the Aveling & Porter building to make way for a car park. For a full list of schools serving Strood see List of schools in Medway. The parish church for Strood is St Nicholas College Yard Strood which is Grade II listed building. St Mary's (notionally Frindsbury) was opened by Bishop Claughton in 1869 as a chapel of ease. It has subsequently closed as an Anglican church but has been taken over by the New Testament Church of God. The other Anglican church in the area is St Francis. There are two Catholic churches; English Martyrs and St Justus. The Methodist church in Stonehouse Lane has undergone two changes of name. First the road name changed to Cliffe Road and then the church changed from "Jubilee" to "Peninsular". During the First World War the church was lent to the St John's Voluntary Aid Department as an auxiliary hospital. Protestant dissenters founded the Zoar chapel in 1782. There is a Gospel Mission Evangelical church in Brompton Lane and an Evangelical church in Darnley Road. Non-League football club Rochester United F.C., formerly Bly Spartans, plays at Bly Spartans Sports Ground in Strood. The club is in the Kent League, at level nine of the English football league system. Anne Pratt (1806–1893), the botanist, was born in Strood. She wrote several books in the 19th century covering a wide range of botanical subjects. She was so well respected for her knowledge of wild flowers that she was granted an allowance from the Civil List. A portrait of her was placed in the Rochester museum. Her most famous work is The flowering plants, grasses, sedges, and ferns of Great Britain and their allies the club mosses, pepperworts, and horsetails. London: Frederick Warne and Co.
Charles Roach Smith (1806–1890) notable amateur archaeologist, died in Strood. He was born at Shanklin, Isle of Wight, the youngest of 10 children. In 1826 he moved to London, and established his own business as a chemist in 1834. In 1876 he and his sister bought Temple Place in Cuxton Road, Strood, and some adjoining horticultural land. In London he made the first collection of Roman coins from London excavations which was bought by the British Museum. He subsequently pioneered 'urban site observation' and his 'Illustrations of Roman London '(1859) remained the principal work on the subject until 1909. He pioneered the statistic study of Roman coin hoards. He was elected fellow of the Society of Antiquaries of London (1836), London Numismatic Society (1837) and was founder member of the British Archaeological Association (1843). After his death, four streets in Strood were named in his honour, Charles Street, Smith Street, Roach Street and Antiquarian Street. Three of these still exist in the vicinity of the Tesco supermarket with Antiquarian Street being demolished and the area now being under the Tesco car park. Isaac Newell (Strood, 24 April 1853 – Rosario, Argentina, 16 October 1907) a teacher and a pioneer of football in Argentina. He was the founder of the Colegio Comercial Anglicano Argentino and the founder of Argentinean football club Newell's Old Boys, which is named in his honour. This club is considered the sixth most important team of Argentina. 1165 Thomas Becket – the story of cutting off the tail of his horse. 1527 Cardinal Wolsey's men stayed overnight in Strood. He stayed in Rochester. 1732 Hogarth visited and made his way Merrily to Frendsbury. 1871 Ex-Emperor Napoleon III and Empress Eugene waited in the garden of the Railway Tavern for the Steamboat. 2010 Gordon Brown visited the Morrisons supermarket in Strood on 6 April having just announced the United Kingdom general election, 2010. ^ Historic England & 1336171. ^ a b Hasted 1797, pp. 546–560. ^ a b c d e f g h i j k l m n o p q r s t Coulson & Collins 1982. ^ a b c Barnard 1994. ^ a b Marsh 1976. ^ Hinkley 1979, p. 14. ^ Hinkley 1979, p. 104. ^ Smetham 1899, pp. 4 and 348. ^ a b c d e f Austin 2006. ^ Barcelona Field Studies Centre 2017. ^ a b Bloom 2013. ^ "Poundworld in administration". Kent Online. Retrieved 13 June 2018. ^ a b Jordan 2017. ^ a b Mitchell & Smith 1994. ^ a b ColesFinch 1976. ^ "RHS Plant Selector - Prunus insititia 'Farleigh Damson'". Retrieved 29 May 2013. ^ Hunt, Keith (20 January 2017). "Drug dealer Sampson Obasusi, of Kingswear Gardens, Strood, jailed for almost seven years". kentonline.co.uk. Retrieved 1 May 2018. ^ Horn, Jenni (5 December 2013). "People in Medway able to return home after flood warning for Kent". kentonline.co.uk. Retrieved 1 May 2018. ^ "Persimmon reaches 75 per cent Medway Gate milestone". kentonline.co.uk. 25 August 2010. Retrieved 1 May 2018. ^ "Video: Temple Waterfront regeneration scheme unveiled". kentonline.co.uk. 7 April 2009. Retrieved 1 May 2018. ^ Historic England & 1086418. ^ Historic England & 1121550. Historic England. "Former Parish Church of St Nicholas, with day centre (Grade II) (1086418)". National Heritage List for England. Retrieved 10 January 2015. Historic England. "Parish Church of St Mary, Vicarage Road (Grade II) (1121550)". National Heritage List for England. Retrieved 15 November 2016. Historic England. "Crispin and Crispianus Public House (Grade II) (1336171)". National Heritage List for England. Retrieved 10 January 2015. Pratt, Anne (1855), The flowering plants, grasses, sedges, and ferns of Great Britain and their allies the club mosses, pepperworts, and horsetails, London: Frederick Warne and Co., archived from the original on 12 January 2015 5 vols 1855 – 1866. A sixth volume was added in 1873, on the grasses sedges and ferns. ^ As of 13th June there is a notice in the window stating the store is closed and that the nearest store is in Gillingham. Wikimedia Commons has media related to Strood. Wikivoyage has a travel guide for Strood.